Bishop Grant and Doctor Wendy: Raise the Roof! Download a printable brochure about this project. During the rainy season in Gambella, Ethiopia, worshippers at the Gambella Anglican Centre and St. Frumentius Theological College will get wet! Architects have designed a circular shaped church building based on a traditional Ethiopian design for the site. This future multi-purpose building is designed to be used for conferences, teaching and worship, and will seat well over 500. Until recent years, there was only one Anglican congregation in Ethiopia. However, during the protracted civil war in Sudan (mid 1970s to early 2000s), many refugees sought shelter in Ethiopia. Many of these new refugees were Anglican and they began churches in the refugee camps. Later Anglican churches were established in the villages of the Gambella region. There are now 80 congregations in Gambella worshipping in a variety of languages including Anuak, Dinka, Nuer, Mabaan, Jum-Jum and Opo. The Gambella Anglican Centre is the heart of the Anglican Churches in Gambella and hosts monthly clergy training, literacy training, and Mothers’ Union training, as well as library facilities and sports programs. It is the future site of the St. Frumentius Theological College, which will open in January 2015. There is currently a church office, a guest house, a library building, a classroom at the centre, and the residence of Bishop Grant LeMarquand, the Area Bishop for the Horn of Africa, and his wife Dr. Wendy. As the original funding for the Gambella Anglican Centre came from a secular organization, a church building was never built. The primary use of the new church will be the St. Frumentius College Chapel. 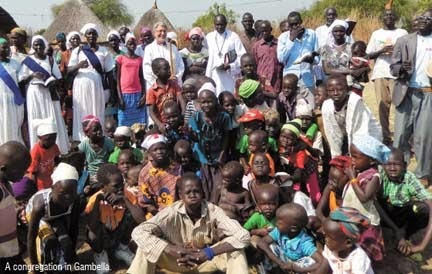 There are only 16 clergy leading 80 churches in Gambella, and a desperate need to train new leaders. Also, there is a need for theological education for the current clergy. As most of the priests were ordained in a war-time situation, they had no opportunity for training. Even now there is only one priest in Gambella who has attended theological college. In addition, the church will be used by the St. Barnabas Anuak congregation, and an English speaking congregation. As there are few large venues in Gambella, it will also be used by large gatherings, lectures and conferences. The ground is currently uneven, and the lower parts need to be filled so that the ground is at the same level. The floor will be constructed from local stone and cement. An arched wall will surround the main worship area. This will allow the air to flow in the church, but still be protected from the rain. A verandah will surround the arched walls, which will provide circulation space and overflow seating.